I have been fascinated by archaeology since, as a child, I enjoyed poking around castle ruins with my father. I chose an archaeological theme for my dissertation at East Berkshire College, writing about prehistoric textiles in Britain. 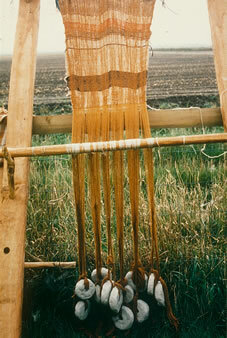 This initial interest in the uncertain origins of spinning and weaving has developed into an enduring passion. My investigations have led me to Cairo, Copenhagen and Zurich in order to unearth evidence of these fundamental skills about which we know so little. The talks listed below have developed from my on-going research. All talks are fully illustrated with slides. I also bring a collection of textile related artifacts, most of which are over 2000 years old and all of which can be handled. In this talk I consider the origins of spinning and weaving in Britain and Northern Europe and the mystery of how and when man (or woman) began to make fabric and thread. I follow a fascinating trail of archaeological clues that leads us back more than 10,000 years into the lives of our ancestors. As part of this investigation I also examine some astonishingly well-preserved clothing which has survived from prehistoric burials in Denmark. This includes the earliest example of embroidery in Northern Europe, dating from c.1300BC. 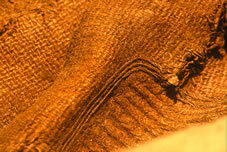 This talk examines the sophisticated textile arts of the ancient Egyptians. 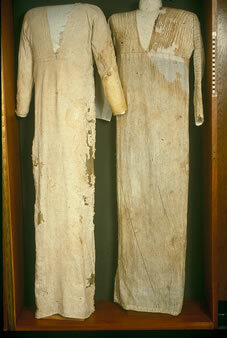 Tomb paintings and hieroglyphic texts tell part of the story but, in addition, the dry desert air has preserved many fabrics including complete dresses and robes. I explore some of the textile techniques used in Egypt 4000 years ago and look in some detail at the remarkable fabrics found in the tomb of Tutankhamun. Although we cannot know for certain when man – or woman – began to spin fibres and weave them into cloth, there are many clues in the archaeological record which suggest that these techniques are at least 10,000 years old. This talk considers the origins of spinning and weaving and looks at some of the earliest surviving fabrics in different parts of the world, including South America, the Middle East, Northern Europe and Central Asia. 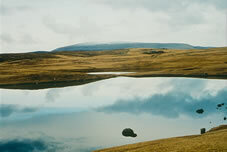 My work is inspired by the landscapes and archaeology of remote places on the Celtic fringe of Britain, in particular Orkney, Shetland and Skomer Island in Pembrokeshire. I use a variety of mixed media materials and found objects to create a sense of these bare, windswept and thinly populated places. I also use symbols and images from megalithic tombs, cairns and passage graves in order to convey the rich history of these places ‘on the edge'. In this talk I discuss the landscapes that inspire me, the archaeology that fascinates me and the techniques that I use to evoke a strong sense of place. I bring examples of completed work, work in progress and sketch books.